Carl Sagan’s scientific baloney detector warns that when the messengers are attacked instead of the evidence and logic, it is a sure sign a discussion has veered away from the foundations of critical scientific analyses. The classic example of such behavior is commonly seen on alarmists’ websites. When skeptics point out the myriad of other factors that also explain climate change, they are slanderously attacked as “deniers of climate change” or “deniers of the greenhouse effect”. Then as if refuting all competing evidence, alarmists showcase NASA’s graph, with a steadily rising global average temperature which “remarkably” coincides with rising CO2 concentrations. 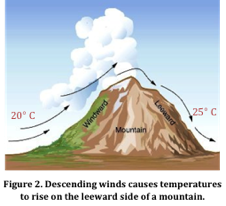 They incorrectly suggest that graphic representation is evidence that CO2 is trapping heat. In truth, the global average is a chimera of many dynamics, dynamics that can raise temperatures without ever adding any additional heat to the planet. Unless those dynamics are properly factored out, the global average tells us precious little about the earth’s current sensitivity to rising CO2 and obscures our understanding of the complex mechanisms of climate change. The dire consequence of a simplistic conclusion based on a “chimeric average” is illustrated by a not?so?ancient allegory about an arthritic elderly man who was unbearably suffering from both cold feet and hot facial flashes. In an attempt to heal himself, he hobbled to the kitchen and placed his head in the freezer and his feet in the oven. His relief was temporary, and his discomfort increased after becoming stuck in that position. Moaning in pain he begged his bed-ridden wife, who was unaware of his predicament, to call for help. Anxiously the wife called 3 doctors. After measuring the temperature of the man’s feet, the first doctor reported that overheating from the oven was causing his pain. Likewise after measuring the temperature of the man’s head, the second doctor reported the pain was caused by the freezer. The third doctor (a former climate scientist) did not make house calls, but compiled the other 2 doctors’ temperature data. After averaging the body’s temperatures, he reported the man’s body temperature was normal. Based on the average, he diagnosed the man’s pain as psychological and referred him to Dr. Lewandowsky. As in the allegory, a “global average” temperature obscures critical dynamics that are best understood by examining local causes of “regional climate” change. Below are 6 factors that must be removed from the global average chimera before we can evaluate how much heat has accumulated and how much heat can be attributed to rising CO2. 1. Warmer Arctic Temperatures Are Largely Due To Escaping Heat! NASA’s map below illustrates how various regions have warmed and cooled during 2000–2009 relative to 1951-1980. On average the recent decade was 0.6°C warmer, but this difference is disproportionately driven by the Arctic that was about 2°C warmer. That unusual extreme warming is called Arctic Amplification that CO2 driven models suggest is the result of absorbing more heat because lost sea ice allows darker ocean waters to absorb more heat. But that explanation is contradicted by a recent evaluation of Arctic Ocean heat content (Wunsch and Heimbach 2014 discussed here) which reveals the upper 700 meters of the Arctic Ocean have been cooling. That cooling suggests unusually warm Arctic air temperatures are instead caused by increased ventilation of heat that had been stored decades ago. To appreciate how ocean oscillations raise the global average by ventilating warmer water, here is an experiment you can do at home with an infrared temperature gun. Heat a large pot of water on the stove. The pot is analogous to the ocean’s deep warm pools. Randomly measure the temperature on 10 spots on the kitchen floor, plus the surface temperature of your pot of water. Then turn off the burner so heat is no longer added to the pot and calculate your kitchen’s average surface temperature. Analogous to an El Nino event, toss half of the water across the floor and recalculate the average. The surface of the water in the pot will not have cooled significantly, but the temperature of the floor will have risen greatly. Without adding any heat, the new average temperature increased simply by spreading subsurface heat. Unlike our kitchen experiment, the oceans will cool much more slowly than the wetted floor. When the sun heats our tropical oceans, evaporation causes that heated water to become more saline and denser. This dense heated water sinks below fresher surface waters that may insulate it for decades. For example, warm Atlantic water takes about 15 years to circulate through the depths of the Arctic. Intruding water maintains a thick layer of warmer subsurface water several hundred meters thick. The upper 3 meters of the world’s oceans hold more heat than the entire atmosphere, so continual ventilation of just 10 meters of warmer subsurface water will affect the global average for decades. Warmer “mode waters” are gradually ventilated during the winter and huge amounts of heat stored at 100 meter depths are ventilated during an El Nino. 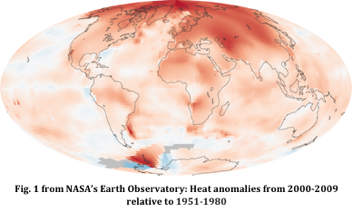 During the warm phase of the Pacific Decadal Oscillation (PDO) from 1976 to 1999, the frequency of heat ventilating El Ninos increased as did the global average. It is reasonable to assume that some of that heat was initially stored during the PDO’s heat-absorbing phase that began in the 1940s during which solar insolation was greater than anytime in the past few hundred years. Because solar heating has declined and (according to the IPCC) added CO2 has little impact on heating tropical waters as discussed in part 2, subsurface heat should decline and future ventilations will not cause a resumption in a warming trend. As seen in NASA’s map of regional warming, the Antarctic Peninsula is another unusual “hotspot”, but relative to other climate dynamics, the contribution from CO2 is again not readily apparent. Stronger winds from the positive phase of the Antarctic Oscillation (AAO) increased regional temperatures without adding heat via 2 mechanisms. First stronger winds from the north reduced sea ice extent by inhibiting the expansion of sea ice along the western Antarctic Peninsula and Amundsen Sea. 3,4 As in the Arctic, more open water allows larger amounts of stored heat to escape, dramatically raising winter temperatures. Accordingly, during the summer when sea ice is normally absent, there is no steep warming trend. Without any additional heat, surface temperatures rise when vegetation is lost and/or soil moisture is reduced. Wherever a forest is converted to a grassland, or a grassland to desert, or barren ground is created, maximum skin surface temperatures rise by 10 to 40°F.8 Also to quench the thirst of growing populations, extraction of subsurface waters has lowered the water table.9 As the water table drops below the reach of roots, soil moisture is reduced and plants die. Reduced vegetation eliminates the cooling effect of transpiration, and prevents the recycling of rainwater that sinks deeper into the ground. Lost vegetation creates hotter surfaces that not only heat the air more severely during the day but also emit much more infrared radiation at night. Even if concentrations of CO2 or water vapor remained unchanged, the infrared radiation from warmer surfaces would add to the greenhouse effect. 5. Rising Minimum Temperatures Are Highly Sensitive to Landscape Changes. Inversion layers trap human waste heat. Hot air only rises if it is warmer than its surroundings. Shallow inversion layers are naturally created at night and in the winter, as air near the surface naturally cools faster than the air above. We can see the height at which warm upper air overlays the shallow cooler layer in the picture below indicated by flattening of rising smoke. Trapped in that shallow layer human waste heat more readily raises the minimum temperature. Furthermore the accumulation of waste heat and the effects of heat-holding surfaces can disrupt the inversion layer and bring warmer air above down to the surface. When farmers fear frost damage, they use huge fans to stir the air, disrupting the inversion layer and warming the surface. Away from growing populated areas where temperatures are measured by tree rings, since the 1950s tree ring temperatures have increasingly diverged from instrumental data tainted by these population/land use effects. Although websites like SkepticalScience claim, “Natural temperature measurements also confirm the general accuracy of the instrumental temperature record,” tree rings undeniably contradict their claims. An international team of tree ring experts reported “No current tree ring based reconstruction of extratropical Northern Hemisphere temperatures that extends into the 1990s captures the full range of late 20th century warming observed in the instrumental record.”15 Using an infrared thermometer, I have observed the dawn temperatures within vegetated areas are 10 to 20°F cooler than surfaces just 20 feet away on paved and gravel country roads, instrumentally confirming that cooler tree ring temperatures are more accurately measuring natural climate change. 6. Models Arbitrarily Raise the Observed Global Average. In a process called data homogenization climate scientists adjust quality controlled raw temperature data to create a more steeply rising average temperature wherever their model suggests the weather behaved “outside statistically unexpectations”. In a sense climate scientists are denying real observations. As discussed here and here, homogenizaton models mistakenly convert natural change points into a steep warming trends. Several climate scientists who have analyzed the adjustment process warned that “results cast some doubts in the use of homogenization procedures” noting the observed 20th century trend was raised from 0.4°C to 0.7°C. 1.Rigor, I.G., J.M. Wallace, and R.L. Colony (2002), Response of Sea Ice to the Arctic Oscillation, J. Climate, v. 15, no. 18, pp. 2648 – 2668. 3. 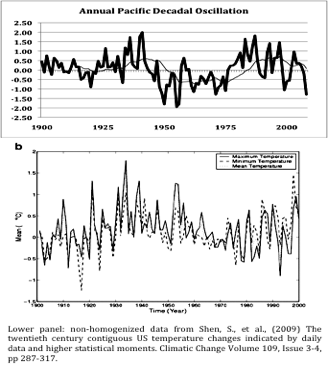 Stammerjohn, S., et a., (2008) Trends in Antarctic annual sea ice retreat and advance and their relation to El Niño southern oscillation and southern annular mode variability. Journal of Geophysical Research. Vol. 113, C03S90.doi:10.1029/2007JC004269. 4.Stammerjohn, S., et a., (2008) Sea ice in the western Antarctic Peninsula region: spatiotemporal variability from ecological and climate change perspectives. Deep Sea Research II 55. doi:10.1016/j.dsr2.2008.04.026. 5.Orr, A., et al., (2008), Characteristics of summer airflow over the Antarctic Peninsula in response to recent strengthening of westerly circumpolar winds, J. Atmos. Sci., 65, 1396–1413. 8.Mildrexler,D.J. et al., (2011) Satellite Finds Highest Land Skin Temperatures on Earth. Bulletin of the American Meteorological Society. 9. Foster. S. and Chilton, P. (2003) Groundwater: the processes and global significance of aquifer degradation. Phil. Trans. R. Soc. Lond. B, vol. 358, 1957-1972. 10. 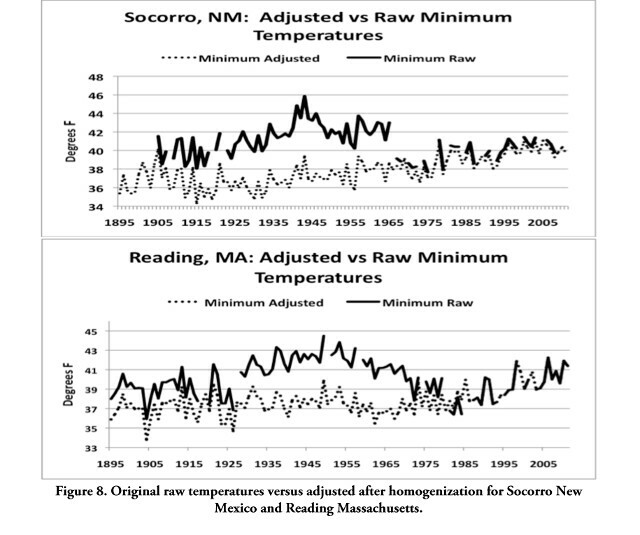 Balling, R. C., Jr (1998) Impacts of land degradation on historical temperature records from the Sonoran Desert. Climatic Change, 40, 669–681. 11. Deo, R. (2012) A review and modeling results of the simulated response of deforestation on climate extremes in eastern Australia. Atmospheric Research, vol. 108, p. 19–38. 13. Gallo, K., et al. (1996) The Influence of Land Use/Land Cover on Climatological Values of the Diurnal Temperature Range. Journal of Climate, vol. 9, p. 2941-2944. 14. Karl, T., et al., (1988), Urbanization: Its Detection and Effect in the United States Climate Record. Journal of Climate, vol. 1, 1099-1123. 15. Wilson R., et al., (2007) Matter of divergence: tracking recent warming at hemispheric scales using tree-ring data. Journal of Geophysical Research–A, 112, D17103, doi: 10.1029/2006JD008318.